Read what Archbishop Pozzo had to say about the SSPX in Zenit on February 26, 2016. We here present some extracts of Archbishop Pozzo's interview, given to Luca Marcolivio and published today in the Italian online version of Zenit. Archbishop Pozzo has been working on the reconciliation of the SSPX in the Pontifical Comission Ecclesia Dei for some years, especially after having been appointed Secretary, for a second time, in 2013. It is not always easy to know exactly what Archbishop Pozzo really means to convey to the press when he speaks about the SSPX. These comments are to be taken in light of the following elements given by Bishop Alfonso de Galarreta in his January conference published today. On July 2015, Rome made another offer to the SSPX. to write an exhaustive explanation to make it very clear how we are and how we act, what we preach, what we do, what we do not do, and what we are not ready to do, in order to find out if the Society really is accepted 'as it is'." The SSPX is still in an irregular position, because it has not received canonical recognition by the Holy See. As long as the Society has no canonical status in the Church, its ministers do not exercise in a legitimate way the ministry and the celebration of the sacraments. According to the formula endeavored by the then Cardinal Bergoglio in Buenos Aires and confirmed by Pope Francis to the Pontifical Commission Ecclesia Dei, the members of the SSPX are Catholics on the path toward full communion with the Holy See. This full communion will come when there is a canonical recognition of the Society. What steps has the Holy See taken? Following the lifting of the excommunications in 2009, a series of meetings were initiated between doctrinal experts appointed by the Congregation for the Doctrine of the Faith, which oversees the Pontifical Commission Ecclesia Dei, after the motu proprio of Benedict XVI, Unitatem Ecclesiae (2009), and experts of the SSPX to discuss and exchange views on major doctrinal issues underlying the dispute with the Holy See: the relationship between Tradition and the Magisterium, the questions of ecumenism, interreligious dialogue, religious freedom, and of the liturgical reform, in the context of the teaching of the Second Vatican Council. We are now at a stage that I believe constructive and oriented to achieve the desired reconciliation. The gesture of Pope Francis to grant to faithful Catholics the opportunity of receiving validly and lawfully the sacraments of reconciliation and anointing of the sick by the bishops and priests of the SSPX during the Holy Year of Mercy is clearly a sign of the will of the Holy Father to favor the path towards a full and stable canonical recognition. I would distinguish two levels. The proper doctrinal level concerns some differences about individual topics proposed by the Second Vatican Council and the post-conciliar Magisterium relating to ecumenism, the relationship between Christianity and the world religions, religious freedom, especially in the relationship between Church and State, and some aspects of liturgical reform. There is also the level of mental and psychological attitudes, which is to move from a position of polemical and antagonistic confrontation, to a position of listening and mutual respect, esteem and confidence, as it should be between members of the same Body of Christ, which is the Church. We need to work on both of these levels. I think the rapprochement undertaken has borne some fruit, especially for this change in attitude by both parties and it is worth pursuing that. Even on the issue of the Second Vatican Council, I think that the SSPX must reflect on the distinction ...between the authentic mens of Vatican II, its intentio docendi, as shown by the official Acts of the Council, and that I would call the "para-council", i.e., the set of theological guidelines and practical attitudes which accompanied the course of the Council itself, then pretending to cover themselves with its name, and that the public, thanks to the influence of the media, overlapped often as the true thought of the Council. Also as regards the Lefebvrian criticism on religious freedom, at the bottom of the discussion it seems to me that the SSPX position is characterized by the defense of traditional Catholic doctrine against the agnostic secularism of the State and against secularism and ideological relativism but not against the right of the person not to be constricted or obstructed by the State in the exercise of the profession of religious faith. However, these are issues that will be a topic for discussion and clarification even after the full reconciliation. What appears crucial is to find a full convergence on what is required to be in full communion with the Apostolic See, namely the integrity of the Catholic Creed, the bond of the sacraments and the acceptance of the Supreme Magisterium of the Church. The Magisterium, which is not above the Word of God written and transmitted, but serves it, is the authentic interpreter also of previous texts of the Magisterium, including those of the Second Vatican Council, in the light of the perennial Tradition, which develops in the Church with the assistance of the Holy Spirit, not with a novelty contrary (which would deny Catholic dogma), but with a better understanding of the Deposit of Faith, in the same doctrine, the same sense, and in the same judgment (in eodem scilicet dogmate, eodem sensu et eademque sententia, cf. Vatican Council I, Const. Dogm. Dei Filius, 4). I believe that on these points the agreement with the SSPX is not only possible, but necessary. About the Mass of the Novus Ordo, despite all the reservations that one has to do about it, I never claimed that it is invalid or heretical." Therefore the reservations about the rite of the Novus Ordo, which are obviously not to be underestimated, do not refer either to the validity of the celebration of the sacrament nor the line of the Catholic Faith. It would therefore be appropriate to continue the discussion and clarification of these reservations. The Holy Father encouraged the Pontifical Commission Ecclesia Dei from the start of his pontificate to pursue a less official and less formal [dialogue] with the SSPX. In this context, the soothing and magnanimous gesture of Pope Francis on the occasion of the Year of Mercy has undoubtedly helped to calm further the state of relations with the Society, showing that the Holy See has at heart the rapprochement and reconciliation which will also need a canonical form. I hope and wish that the SSPX shares the same feeling and the same will. Archbishop Pozzo: "As long as the Society has no canonical status in the Church, its ministers do not exercise in a legitimate way the ministry and the celebration of the sacraments." Archbishop Pozzo: "The gesture of Pope Francis to grant to faithful Catholics the opportunity of receiving validly and lawfully the sacraments of reconciliation and anointing of the sick by the bishops and priests of the SSPX during the Holy Year of Mercy..."
-- SSPX bishops and priests "do not exercise in a legitimate way the ministry and the celebration of the sacraments." -- However, the Faithful may receive "validly and lawfully the sacraments of reconciliation and anointing of the sick by the bishops and priests of the SSPX during the Holy Year of Mercy..."
Yeah Mark, that's right; and it all magically disappears at 12:01AM December 8, 2016. What a joke. They've had Faculties all along! Pope Francis, on September 1, 2015 A.D., noted the SSPX's "good faith and sacramental practice..."
The SSPX possesses good "sacramental practice" but "its ministers do not exercise in a legitimate way the ministry and the celebration of the sacraments." It's not quite magic, it's law. If a lawmaker says that a certain law comes into effect at a certain time, then it comes into effect at that time. And facilities are a juridical reality. So if the proper authority says that a priest has facilities for a certain time, then he has that faculty for that time. "About the Mass of the Novus Ordo, despite all the reservations that one has to do about it, I never claimed that it is invalid or heretical." Anon at 3:06AM: Yes, of course; you are absolutely correct, it is the law and we uphold the law. Yet, we see how ludicrous the whole situation is. Still, the SSPX makes a strong argument about "ecclesia supplet." Let us all hope they are in the house soon and not just in the back yard. Pope Francis dislikes even the appearance of legalism. Therefore, should he remain Pope, I believe that his positive assessment of the SSPX's administration of the Holy Sacrament of Penance will remain in place. The SSPX may even obtain regulation by then. In fact Jorge Bergoglio dislikes legalism so much, it blinds him to the point of despising and rejecting doctrine. Or maybe (as a rational being I look at evidence and speculate here) doctrine which he mistakes for legalism necessarily prevents the unification of contradictory beliefs which he strives for. Jorge Bergoglio's admiration for Luther's contribution to Christian unity by rejecting exclusive claims of the Holy Catholic Church may be prompting him to demonstrate a reluctant but necessary half-hearted acceptance of Catholics. After all, we have all seen his January video, where he openly promoted belief in love. Catholics believe in God who is love (among other 'things"), while Bergoglio believes in love which is more important to him than belief in God. This is where doctrine (really a product of rational, logical thought in the context of faith in our Creator) which Bergoglio mistakenly rejects as legalism shows its superiority of vulgar ideology. We all know the many different meanings people assign to love. Love can even mean murder, according to some. Pope Benedict XVI insisted that "Luther’s thinking, his whole spirituality, was thoroughly Christocentric:"
Huh? I thought that only Pope Francis offered "admiration" in regard to Martin Luther? I thought that Martin Luther was evil? However, Pope Benedict XVI sung Martin Luther's praises. "Luther’s thinking, his whole spirituality, was thoroughly Christocentric," according to Pope Benedict XVI. Pope Benedict XVI also declared that it "was the error of the Reformation period that for the most part we could only see what divided us and we failed to grasp existentially what we have in common in terms of the great deposit of sacred Scripture and the early Christian creeds. "The great ecumenical step forward of recent decades is that we have become aware of all this common ground and that we acknowledge it as we pray and sing together, as we make our joint commitment to the Christian ethos in our dealings with the world, as we bear common witness to the God of Jesus Christ in this world as our undying foundation." Pope Benedict insisted that it is an error to "see what divided us". Rather, we must pray with Lutherans and focus upon all the "common ground" that we share with Lutherans. Sorry, but those who wish to attack Pope Francis' ecumenical approach to Lutherans need to realize that all he has done is to continue Papal ecumenical policies that his predecessors, such as Pope Benedict XVI, had practiced. Our Popes praised Protestants long before Pope Francis' Pontificate. He is just pursuing the path that Popes first paved decades ago. It was Pope Venerable Pius XII who declared that the Holy Ghost had inspired the Ecumenical Movement. It was Pope Venerable Pius XII who entered the Church into the Ecumenical Movement. "Even on the plea of promoting unity it is not allowed to dissemble one single dogma; for, as the Patriarch of Alexandria warns us, ‘although the desire of peace is a noble and excellent thing, yet we must not for its sake neglect the virtue of loyalty in Christ.’ Consequently, the much desired return of erring sons to true and genuine unity in Christ will not be furthered by exclusive concentration on those doctrines which all, or most, communities glorying in the Christian name accept in common. The only successful method will be that which bases harmony and agreement among Christ's faithful ones upon all the truths, and the whole of the truths, which God has revealed." (Pope Pius XII, Encyclical Orientalis Ecclesiae, par. 16. As regards the manner and method of proceeding in this work, the Bishops themselves will make regulations as to what is to be done and what is to be avoided, and shall see that these are observed by all. They shall also be on guard lest, on the false pretext that more attention should be paid to the points on which we agree than to those on which we differ, a dangerous indifferentism be encouraged, especially among persons whose training in theology is not deep and whose practice of their faith is not very strong. For care must be taken lest, in the so-called “irenic” spirit of today, through comparative study and the vain desire for a progressively closer mutual approach among the various professions of faith, Catholic doctrine — either in its dogmas or in the truths which are connected with them — be so conformed or in a way adapted to the doctrines of dissident sects, that the purity of Catholic doctrine be impaired, or its genuine and certain meaning be obscured. Actually only those are to be included as members of the Church who have been baptized and profess the true faith, and who have not been so unfortunate as to separate themselves from the unity of the Body, or been excluded by legitimate authority for grave faults committed. “For in one spirit” says the Apostle, “were we all baptized into one Body, whether Jews or Gentiles, whether bond or free.” As therefore in the true Christian community there is only one Body, one Spirit, one Lord, and one Baptism, so there can be only one faith. And therefore if a man refuse to hear the Church let him be considered — so the Lord commands — as a heathen and a publican. It follows that those [who] are divided in faith or government cannot be living in the unity of such a Body, nor can they be living the life of its one Divine Spirit. Now since its Founder willed this social body of Christ to be visible, the cooperation of all its members must also be externally manifest through their profession the same faith and their sharing the same sacred rites, through participation in the same Sacrifice, and the practical observance of the same laws. Above all, it is absolutely necessary that the Supreme Head, that is, the Vicar of Jesus Christ on earth, be visible to the eyes of all, since it is He who gives effective direction to the work which all do in common in a mutually helpful way towards the attainment of the proposed end. As the Divine Redeemer sent the Paraclete, the Spirit of Truth, who in His name should govern the Church in an invisible way, so, in the same manner, He commissioned Peter and his successors to be His personal representatives on earth and to assume the visible government of the Christian community. You say: "Sorry, but those who wish to attack Pope Francis' ecumenical approach to Lutherans need to realize that all he has done is to continue Papal ecumenical policies..."
I am not sorry that I do not wish to attack anyone. I denounce the phony Jorge Bergoglio is for the sum of his theological and pastoral accomplishments. I am not sorry for calling him a phony and not afraid of the just judgement of God regarding my judgement of Bergoglio. Is he but one in a too long line of misguided popes? If in fact his predecessors were no better than he is, I will gladly admit it. 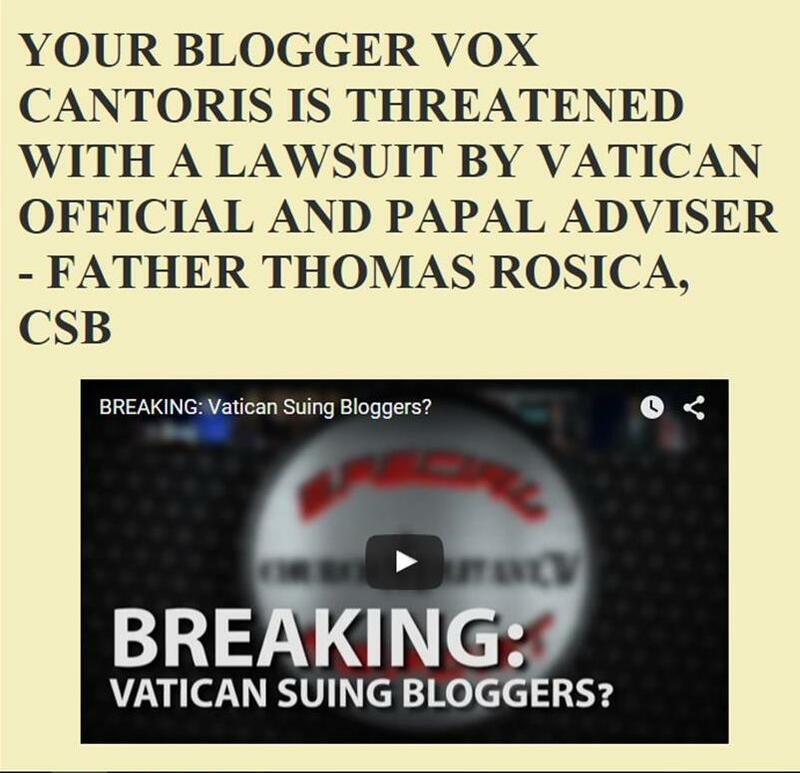 It is not personal (not exclusively against Bergoglio), it is the only true faith business. Sorry, Vox, for returning so quickly. Mark Thomas, I want to let you know that I have a strong conviction regarding the One True Church. The true Church are the people who follow Jesus Christ as the Way, the Truth and the Life. Those who don't, even if they occupy the highest positions in the Vatican, are phonies, they are hypocrites and deceivers. A person who travels across an ocean to visit a country in an official capacity as a Christ follower, who won't even mention His Name while speaking publicly, is not a follower of Christ. This unity he wants is a phony unity (one built on the lowest common denominator with no potential to raise it, ever), and he is a phony Christian. an epitome of stupidity and wickedness. "A person who travels across an ocean to visit a country in an official capacity as a Christ follower, who won't even mention His Name while speaking publicly, is not a follower of Christ." Dorota, do you mean His Holiness Pope Francis? If that is the case, do you mean that Pope Francis failed to mention the Name of Jesus Christ during Apostolic Visits to various countries? I wish to make certain that I have understood you correctly. Thank you, Dorota. "... doctrine which he mistakes for legalism necessarily prevents the unification of contradictory beliefs which he strives for." "This unity he wants is a phony unity (one built on the lowest common denominator with no potential to raise it, ever)..."
Well, it is hearsay. I couldn’t make myself to listen or even read. Thank you, no response required. I am sure your impeccable reasoning will as usual be... leaving a lot to be desired, or at least a minimum of reason. Again, same mistake, Vox. I wasn't done yet. Haven't really started. after Jorge Bergoglio was invited to speak before the UN (or informed the UN he would come to speak - I am not sure which it was), he did not come as a random person just off the street. He did not come simply as a head of state, not as a prime minister or a royal, did he? He wore his white garbs (not red shoes to symbolize the blood of the martyrs, I give you that), travelled on a special plane (I think it displays a One World logo, doesn't it? ), was welcomed with great fanfare by the warmongering Nobel Peace prize winner and "we are no longer a Christian nation" + family himself. Why did he come, and in what capacity? When he spoke, I saw the highest officials of the US government cry. So moving was he. But who or what did he represent when he spoke? Please, Mark Thomas, do not give me the same nonsense you found in the linked article. Don't you think Bergoglio's audiences knew he is the pope? Don't you think they knew what that means with regard to his official job description and the identity of his Boss? If they were going to be unable to handle the Name I am thinking right now and you have guessed correctly, why would they even go to listen to the one who represents the bearer of that Name on this earth? If you have any decency, DO NOT respond. Remember, God is merciful, aaaaaand He is just. Mercy is not the whole story. Correct.Since the time of Pope Pius XII an irrational inference is being used to reject the traditional interpretation of the dogma extra ecclesiam nulla salus (EENS). Then with this irrational inference popes have interpreted Vatican Council II as a break with the strict interpretation of EENS. So the result is a new ecclesiology with reference to Christian communities and other religions.According to the new ecclesiology there is salvation outside the Church. So all Protestants and Jews for example, do not necessarily need to convert. They could be saved outside the Church. This is the theology of the International Theological Commission, Vatican,which is approved also by Pope Benedict and Cardinal Muller.It is being followed by Pope Francis. The political Left do not object.